In a separate filing, the federal special counsel said Friday Cohen was in touch as far back as 2015 with a Russian who offered “political synergy” with the Trump election campaign. In a court filing, prosecutors said former Trump lawyer and fixer Michael Cohen arranged the secret payments at the height of the 2016 campaign “in coordination with and at the direction of” Trump. Cohen has previously said Trump was involved in the hush-money scheme, but court documents filed ahead of Cohen’s sentencing made clear prosecutors believe Cohen’s claim. 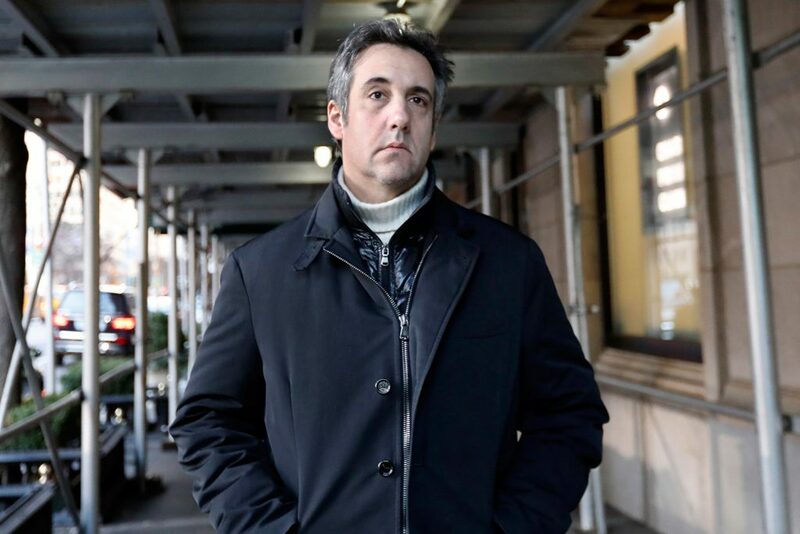 Michael Cohen, former lawyer to President Trump, leaves his apartment building on New York’s Park Avenue on Friday. Prosecutors are recommending substantial prison time for Cohen. The two memos were submitted to U.S. District Court Judge William Pauley III, who is scheduled to sentence Cohen. Mueller submitted a seven-page memo that doesn’t take any firm position on how long Cohen should spend in prison. Cohen, they claimed, relished the role of being Trump’s “fixer,” trying to use it to win a role in the administration, and then, when that failed, he set out to swindle companies out of money by tricking them into thinking he could provide access and insight. In reality, though, they said Cohen was not much more than “a man whose outlook on life was often to cheat,” and he did not deserve to be spared entirely because he finally decided to plead guilty. “After cheating the IRS for years, lying to banks and to Congress, and seeking to criminally influence the Presidential election, Cohen’s decision to plead guilty – rather than seek a pardon for his manifold crimes – does not make him a hero,” prosecutors wrote. Prosecutors repeatedly highlighted what they suggested was minimal information provided by Cohen, noting that while he also met with New York state investigators and tax authorities, that cooperation “warrants little to no consideration as a mitigating factor” because Cohen told them nothing of value beyond what they would probably have gotten without his help. The special counsel’s office added, though, that Cohen had also “explained financial aspects of the deal that would have made it highly lucrative,” and, without prompting, he had corrected other statements he made about his contacts with Russian officials during the campaign. For example, Cohen said in a radio interview in September 2015 that Trump should meet with the president of Russia during the United Nations General Assembly, and he claimed for a time afterward that the comment had been “spontaneous” and not discussed with members of the campaign. In fact, the special counsel’s office said, Cohen later admitted that he had conferred with Trump about contacting the Russian government for the meeting – which ultimately did not happen. In asking for a sentence of no prison time, Cohen stressed his extensive cooperation with Mueller as well as investigators from other agencies. His lawyers linked his wrongdoing directly to Trump, writing that Cohen was motivated to pay the women to keep quiet and lie to Congress out of his “fierce loyalty” to Trump. Trump had publicly denied the affairs and said he “stayed away” from business in Russia. “He could have fought the government and continued to hold to the party line, positioning himself perhaps for a pardon or clemency, but, instead – for himself, his family, and his country – he took personal responsibility for his own wrongdoing and contributed, and is prepared to continue to contribute, to an investigation that he views as thoroughly legitimate and vital,” Cohen’s lawyers wrote in court papers submitted last week. Trump ridiculed Cohen’s request on Twitter and seemed to contrast him with Roger Stone, a longtime Trump adviser who has suggested publicly that he would be unwilling to cooperate against the president.